Located in the northeast corner of Morgan County and sprawled out over 187 acres of lush greenery sits MC Roberts Racing Stables, the home and training center to over 60 thoroughbred race horses. Taking just over a year to build, the farm was completed in December 2007 and has been evolving into a thriving breeding and training facility ever since. Thoroughbred trainer and facility owner Merrill Roberts tells us, “We don’t train these horses for pleasure riding. These are working horses, professional race horses. I am training them to be winners”. 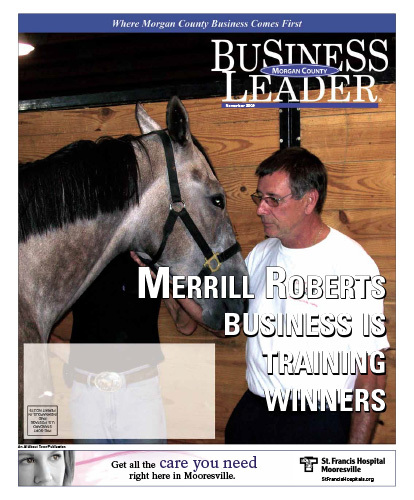 Working just as hard as the horses he trains, Merrill has put in 10 to 12 hour days, six to seven days a week, since he began building his thoroughbred facility in the fall of 2006. The facility has a main barn that with 36 stalls and an indoor 64 foot diameter exerciser, and is also equipped with a mare barn with ten stalls, each with video surveillance that is used to record the progress of pregnant mares and foaling. Apart from the main barn, and the mare barn, the facility has an outside pen for play and two quarantine stalls used for any horse that becomes ill and is infectious. If the beautiful horse’s grazing in one of the facility’s nine pastures do not catch your eye, the impressive half mile dirt and turf race track is sure too. If you’re driving that stretch of Mann Road early in the morning hours you might get lucky enough to catch one of these beautiful thoroughbreds in training on the facility’s track. The facility has a high level of security and surveillance for the safety of the horses. Download the full November 2009 Edition here.